During the Second World War, the British government introduced rationing so that the population wouldn’t run out of food. I’ve been doing lots of research on this subject for the novel that I’m writing, but I’ve decided that simply reading about it isn’t enough. I think I need to experience it. Well, some of it. I’m not so dedicated to my craft that I’d actually change my entire diet (although some people do), but I have been trying out some 1940s recipes. One of the main aims of the Ministry of Food during the war was to convince the British public that vegetables were healthy, filling and delicious. Eggs, sugar, cheese, butter and meat were rationed, so housewives were encouraged to be creative with potatoes, parsnips, swedes, cabbage, cauliflower – even nettles. An oversupply of carrots at one stage resulted in a Ministry of Food advertising campaign led by a cartoon ‘Doctor Carrot’, who explained how to make ‘carrot soup’, ‘carrot croquettes’, ‘carrot pudding’, ‘Carrolade juice’, ‘curried carrots and chestnuts with potato border’, ‘carrot savoury’, ‘braised carrots’ and ‘boiled carrots’ (I think they were running out of ideas by the end). I was tempted by the idea of ‘carrot fudge’, until I read that it consisted of carrots, gelatine and orange essence. I could not see how that could be remotely appetising, and this blogger’s attempt to make it simply reinforced my aversion. However, I thought ‘carrot cookies’ sounded interesting, so I gave them a go. This version comes from the wonderful World Carrot Museum website. Method – Cream the fat and the sugar together with the vanilla essence. Beat in the grated carrot. Fold in the flour. If mixture is very dry, add a little water. Drop spoonfuls onto greased tray and press down just a little. Sprinkle tops with sugar and cook in an oven at 200° Celsius for about 20 minutes. In the interests of authenticity, I used my most withered carrots (few houses back then had refrigerators). I suspect that 1940s flour was somewhere between our white and wholemeal flour, but I only had plain white flour, so I used that with baking powder. I wasn’t quite sure what sort of sugar was most common then, so I used caster sugar. Unfortunately, I don’t have a 1940s wood-burning stove (or even a gas stove), but I did grate the carrots and beat the mixture BY HAND (mostly because I don’t own a food processor). 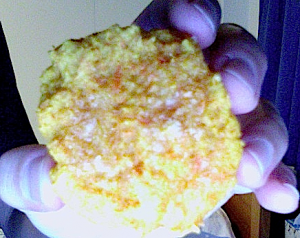 A cookie - made of carrots! I didn’t have very high expectations, but these cookies were delicious! They were moist and chewy, rather than crisp, and tasted like a cross between plain sugar cookies and pumpkin scones. I must admit they didn’t taste much like carrots, although they were very orange – and very sweet. If I made them again, I’d only use one tablespoon of sugar, and I wouldn’t sprinkle extra sugar on top before baking. It just shows how much natural sugar is in carrots (now those Ministry of Food recipes for ‘carrot lollies’ make more sense to me). I’d also use wholemeal flour next time. So, a success! But I think my next attempt at 1940s food will be something savoury. Stay tuned for updates on the Kitchen Front. Hi Have just been reading your page because i am looking for an original CAROLLADE recipe. I am a teacher and just about to embark on a new topic – The war, I am doing the rationing aspect of this, and would love to make some of the drink for the children to taste… Any suggestions where i can find an original recipe. I just know it is made from carrots and swedes..
Hi Benny. The Carrot Museum describes Carrolade as grated carrots and grated swedes squeezed through muslin, but doesn’t show the quantities of ingredients. The museum also provides a (slightly) more appetising modern Carollade recipe here. Perhaps you could try contacting the curator of the Carrot Museum for more details – their email address is at the end of their webpage.